Kid's Single Blue No 21 Novelty Racing Car Bed. Ideal for the next Formula 1 World Champion. The Stunning No 21 Racer will make sure your child loves bedtime, as bed time will be the most exciting part of the day. 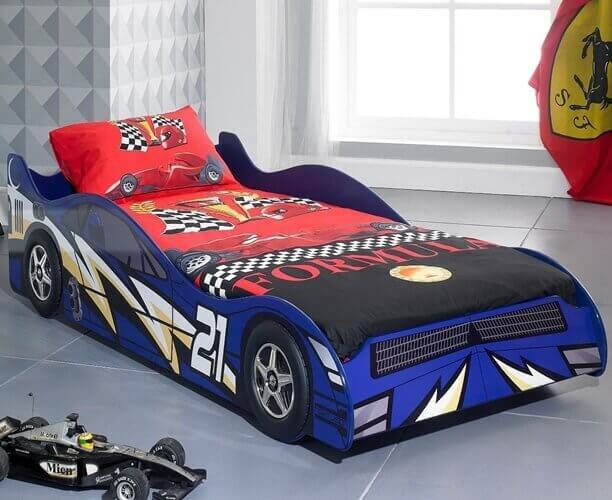 The Racing Car Bed will transform a normal room to a fun and lively bedroom where dreams can come true. The rear spoiler, flame design and slender build make it reach stunning speeds and it will have your child dreaming of bedtime. ﻿This car is designed to take a standard 3'0 single mattress which means it is ideal for a growing child. The slatted base provides extra ventilation and mattress support. Made from Solid MDF with High Quality Red Gloss Finish.